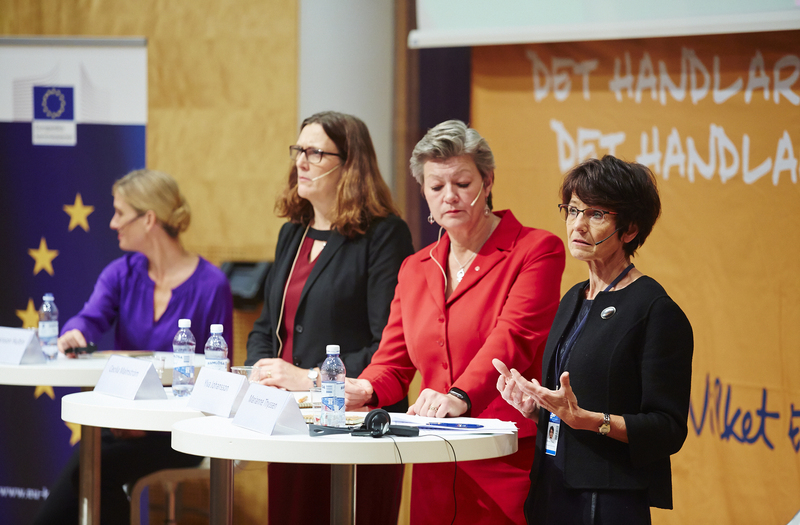 On 16 November 2017, on the eve of the social summit for fair jobs and growth, Commissioners Cecilia Malmström and Marianne Thyssen, together with Swedish minister for employment and integration Ylva Johansson took part in a Citizens' Dialogue in Gothenburg. The Dialogue was moderated by Swedish journalist and foreign affairs analyst Therese Larsson Hultin. The discussions focussed mainly on social and labour market issues. Commissioner Thyssen explained what could be expected to happen at the EU Social Summit the following day and what its outcome could be. The EU Declaration of Social Rights is to be signed by the presidents of the Parliament, the Council, and the Commission. Following a question from the audience, she explained that the Pillar is broader than the social rights chapter in the EU Charter of Fundamental Rights. Ms Thyssen underlined that a signal is to be given at the highest political level to citizens that it is time for action in the social field, and time for hope. She also explained that it is not the EU level alone that can take the necessary measures. Responsibility in the social field is shared with the Member States, who need to do their bit. The Summit should also serve to mobilise the social partners. 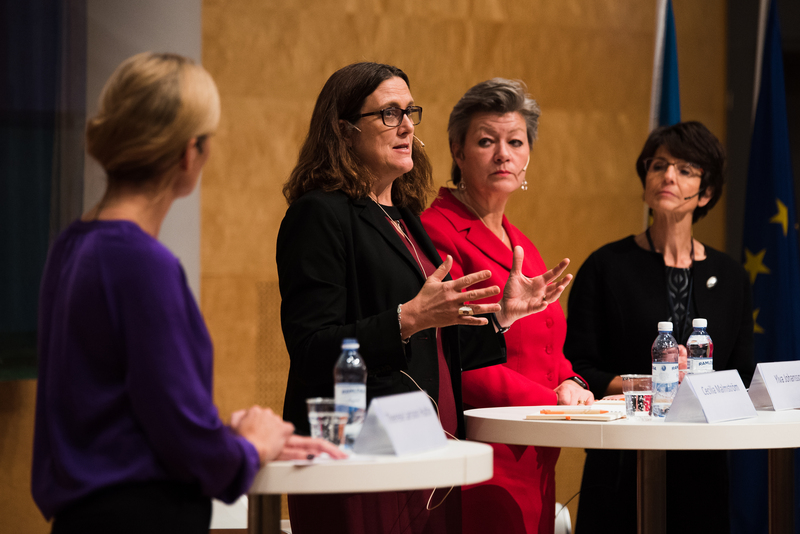 Ms Malmström pointed to the untapped potential regarding women’s participation in the labour market. She explained that this is not just an equal rights issue, but an economic one. Our economies are still missing out on a lot of talent. Minister Johansson also underlined the need for cooperation between "Brussels" and the national level. All member states should commit to the action plan to implement the Social Pillar. Even beyond that, all stakeholders must be involved, including young people. Probably due to the attractiveness of the Social Summit for social partners, NGOs etc., the audience was a more international mix of people than might otherwise have been expected. Questions focussed on social issues, but there were also some that were more general (see below). There were many young people in the audience, students as well as young professionals, and the employment situation of young people was a major topic. Ms Thyssen stated that there are proposals for more transparency in contracts, and more stability. This should help young people in particular, who often find themselves in precarious employment situations. She and Ms Johannsson stressed the importance of life-long learning. While the current generation of graduates might be the best-educated ever in Europe, things are changing so quickly that employees will have to keep learning new skills. While life-long learning works well as far as the most highly skilled workers are concerned, there is need for improvement for low-skilled workers. Ms Thyssen also stressed the need for budgetary responsibility, or else we would put another big brick into the backpacks of young people. Reacting to a question about discrimination in some member states leading to migration, Commissioner Malmström explained that it is up to the member states to end such discrimination. Nevertheless, the EU has macroeconomic conditions that need to be fulfilled in order to access EU funds, such as the social fund. E.g., in Romania, the Roma must be integrated. This is not always easy, as the people concerned also have to want to be integrated for the process to work. Following a question about digitalisation and automatisation leading to job losses, Minister Johansson embraced competition, open borders, and free trade. She explained that we must not protect jobs, we must protect people. If a certain business model no longer works, one must do something else. A participant urged further action against poverty, to which Ms Thyssen replied that indeed, poverty levels are not acceptable. In many Member States, having a job is the key protection against poverty, so that is what the main focus of poverty protection is on. EUR 2,4 billion have been added to the youth guarantee for that purpose. At least 20% must be used for social inclusion.